Visiting the Douglas-Apsley National Park and its popular turquoise waterhole is an absolute must when visiting Tasmania’s east coast during summer. While a short 10 minute walk and swim in the Apsley Waterhole is fantastic on its own, the area also play host to the much more unique and challenging hiking experience; the Apsley Gorge Circuit. 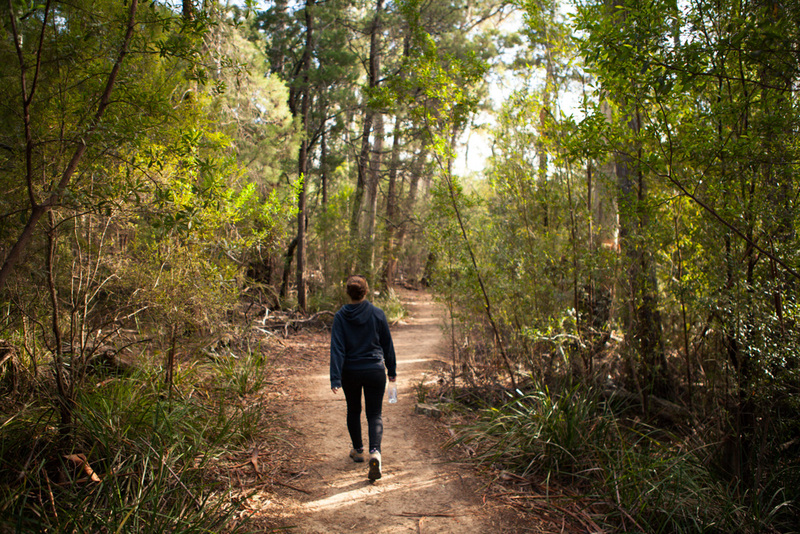 This 4 hour, 8km walk begins with an easy graded walk through the largest dry sclerophyll forest in Tasmania and finishes with a challenging scramble past waterfalls and waterholes through deep river gullies. 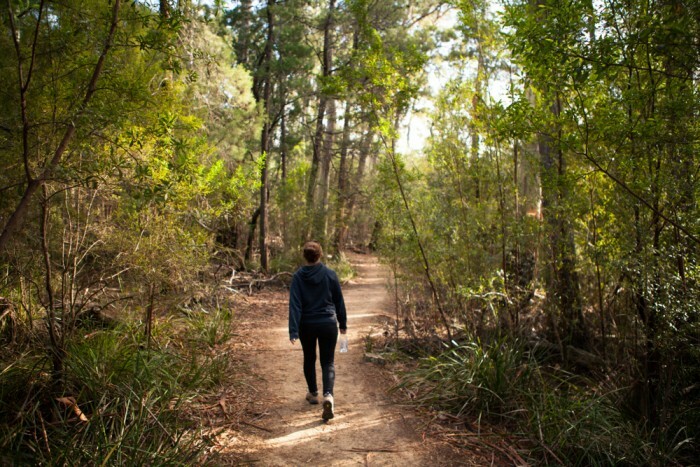 View Google Map Directions The Douglas Apsley National Park is located 3km inland from Bicheno. From the closest major town of St Helens head south on Ceclila Street (A3) towards Bicheno for 60km. Just before reaching Bicheno turn right onto Rosedale Road and continue for 4km. From here the road passes through private farmland and continues via a gravel track to the National Park carpark. 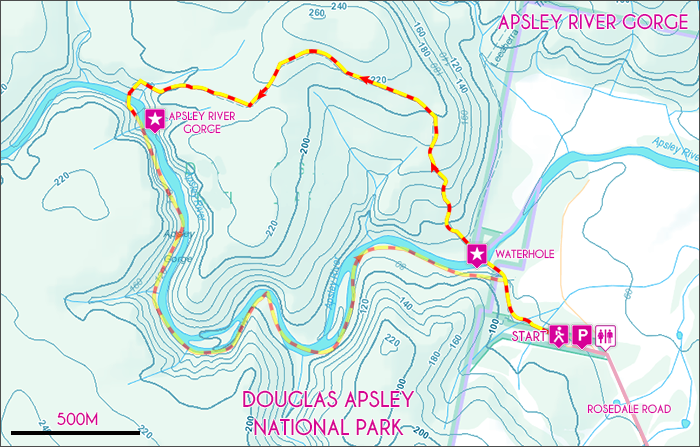 The following guide details the Apsley River Gorge walk as a circuit returning to the carpark via the river bed. This route is difficult and should only be attempted during drier summer months. An easier alterative is available by following the main trail back from the Gorge (Easy – 6km return). Sturdy shoes are necessary as some sections of the river bed require careful scrambling. Leaving from the carpark shelter the track leads gently downhill to the Apsley Waterhole 10 minutes away. Cross the river via the rocks to the right of the waterhole. Once on the opposite bank the track heads north-west uphill and continues through brilliant dry sclerophyll forest for 1km. This 150m climb uphill is easily manageable thanks to the soundly constructed track. As you near the top of the climb the track veers west for another 1km towards the Apsley River. The track gently descends for some time before quickly dropping to the river’s edge via a steep stone stepped gully. Once at the river the beautiful Apsley Gorge can be reached 100m downstream. If you find any sections of the track or river walk up to this point difficult it is recommended that you return to the carpark via the same overland track. The Apsley Gorge and its stunning waterfalls cascading into the pristine waterhole make an idyllic spot for lunch and a swim, however many equally beautiful spots will constantly be presented on the journey home. For the next 3 hours the walk continues off track via the river bed nestled between grand dolerite cliffs. There are no specific track markers and many sections are rugged and can be quite difficult due to water levels. Common sense is the guide from here, you may at times be required to retrace your steps and cross the river to the opposite bank. After many bends and scrambles over rugged river rocks the original Apsley Waterhole near the trailhead is rediscovered.